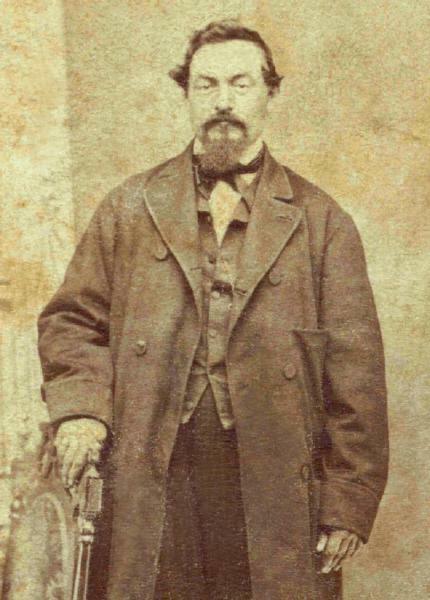 Johannes Kämmerer was born on 16 November 1827 in Undenheim, Rheinhessen. He was baptized/christened on 17 November 1827 in Undenheim, Rheinhessen, in der katholischen Kirche. Sponsor was Johannes Kaemerer, unmarried, from Undenheim. Johann was left an orphan when his father died on the day after his 14th birthday, his mother having died when he was nine years old. After his father's death, he left Undenheim and went to Biebelnheim where he was apprenticed to tailor Jacob Dexheimer. He married Anna Elisabetha Dexheimer, daughter of Johann Jacob Dexheimer and Anna Margaretha Hofmann, on 8 January 1849 in Biebelnheim, Rheinhessen. According to family records, John Kammerer immigrated to America on 8 July 1850, and his wife Elizabeth and children Margaret and Adam followed in 1851. While the actual record of his passage has yet to be found, his family arrived in the Port of New York on 2 May 1851 aboard the ship South Carolina. He was known as John Kammerer after immigrating to the United States. In 4 September 1853, Johannes Kämmerer was living in New York City, Borough of Manhattan, New York, at 191 West 38th Street. John Kammerer is not listed in the 1854-55 Manhattan City Directory. Johannes Kämmerer and Anna Elisabetha Dexheimer appeared in the US federal census of 1 June 1860 in Niagara, Niagara County, New York. Other members of the household included Margaretha Kammerer, Adam Kammerer, Elizabeth Kammerer, Susanna Kammerer, Jacob Andrea Kammerer and Philippina Kammerer. He was a tailor, according to the 1860 census. Johannes Kämmerer and Anna Elisabetha Dexheimer, appeared in the US federal census of 1 June 1870 in Suspension Bridge, Niagara County, New York. Other members of the household included Adam Kammerer, Susanna Kammerer, Jacob Andrea Kammerer, Philippina Kammerer, Katrina Franziska Kammerer, Anna Marie Kammerer and Helen Kammerer. He was a butcher, according to the 1870 census. Johannes Kämmerer and Anna Elisabetha Dexheimer appeared in the New York state census of 1 June 1875 in Niagara County, New Yoirk. Other members of the household included Adam Kammerer, Jacob Andrea Kammerer, Philippina Kammerer, Katrina Franziska Kammerer, Anna Marie Kammerer and Charles Otto Ernest Ford. While John, Elizabeth, Adam and Jacob "Kimmerer" are recorded at the bottom of page 51, daughters Phebe, Katie, Mary and Helen "Kimmerer" are enumerated 10 pages away at the top of page 62, appearing to be daughters of Daniel and Elizabeth Ott. He was a hotel keeper, according to the 1875 census. Johannes Kämmerer and Anna Elisabetha Dexheimer appeared in the US federal census of 1 June 1880 in Suspension Bridge, New York. Other members of the household included Katrina Franziska Kammerer, Helen Kammerer and Jacob Andrea Kammerer. He was a butcher, according to the 1880 census. He was a sponsor at the baptism/christening of John Balthasar Kammerer on 16 October 1881 at Zion Evangelical Lutheran Church in Suspension Bridge, Niagara County, New York. John Balthasar Kammerer was named after his paternal and maternal grandfathers Johannes Kämmerer and Balthasar Weiler. He was a sponsor at the baptism/christening of Lorenz Valentine Frank on 5 August 1883 at in the house of Cornelius Frank in Niagara Falls, Niagara County, New York; by August Oscar Gallenkamp, pastor at Suspension Bridge, according to the Zion church register. He was a sponsor at the baptism/christening of Louise Kammerer Eimer on 10 August 1884 at Zion Lutheran Church in Niagara, Niagara County, New York. He was a sponsor at the baptism/christening of Christiana Franziska Eimer on 16 December 1888 in Suspension Bridge, New York; at the home of her grandparents, according to the churchbooks of Zion Lutheran Church. The following appeared on 20 September 1897 in the Niagara Falls Gazette: Mr and Mrs John Kammerer celebrated their golden wedding and the birthday of their son, Adam Kammerer, at their home on Lockport Street yesterday afternoon. The occasion was a [illegible] and the gathering will be a memorable one for those who attended. There were 61 guests present and of these 53 were relatives of the family. Mr. and Mrs. Kammerer were the recipients of valuable presents, and congratulations were showered upon them. Their 50 years of married life have been peaceful and prosperous and productive of much good. Yesterday they were surrounded by their children, grandchildren and other near relatives and the meeting and the memories it awakened must have been very pleasant to them. In the evening a supper was served. Johannes Kämmerer and Anna Elisabetha Dexheimer appeared in the US federal census of 1 June 1900 in Niagara, Niagara County, New York, at 2211 Lockport Street. Johannes Kämmerer and Anna Elisabetha Dexheimer appeared in the US federal census of 15 April 1910 in Niagara Falls, Niagara County, New York, at 2307 Lockport Road. Other members of the household included Ruth Hamilton. Ruth Hamilton Hannigan, boarding in the household, was employed as a private nurse by the elder Kammerers; her son Sylvester "Buzz" will marry their granddaughter Louise Ford. John and Elizabeth Kammerer were photographed about 1910. Johannes Kämmerer died on 6 February 1912 at age 84 in Niagara Falls, Niagara County, New York. Anna Elisabetha Dexheimer became a widow at his death. The following appeared on 6 February 1912 in the Niagara Falls Gazette: John Kaemmerer, an old resident of the city and once identified in the public affairs of the old village of Suspension Bridge, died at his late home in Lockport street at 3 o'clock this morning after an illness of five weeks. He was 84 years old and death was due to old age. The funeral arrangements will be made known later. Mr. Kaemmerer was born in Untenheim, Hessen-Darmstadt, Germany, on December 16, 1827, and came to the United States in 1850. After living five years in the metropolis he moved to the village of Suspension Bridge and lived there until his death. He was a Democrat and once took an active part in politics. He served as street superintendent for the village of Suspension Bridge before it became a city with the village of Niagara Falls. He was a volunteer fireman for eleven years, being a member of Excelsior Hook and Ladder No. 1. He was also a charter member of the German Verein. He leaves his wife, Elizabeth Kaemmerer, six daughters Mrs. Fred Borth and Mrs. G. W. Barnett of Buffalo, Mrs. Cornelius Frank of Devil's Lake, North Dakota; Mrs. Louis Eimer, Mrs. Charles O. Ford and Mrs. Albert J. Hoffman of this city and Mr. Jacob A. Kaemmerer of Toronto, Ont. Mr. Kaemmerer also leaves 47 grand-children and 21 great-grandchildren. With a deeply troubled heart I take up my pen to write you the sad news of your dear father. He died after 5 weeks of grave illness. He had lost his mind. Oh, you dear ones, you can’t imagine the trouble we had with him. He knew no one except his dear mother. This was his consolation. Oh, he was so terribly ill, it was painful for all of us. Your brothers and sisters did so much for him. Now the . . . The good Lord has taken him home. Now he rests with his two dear children. He suddenly became deathly ill on January 3, and he died on February 5 at half past four in the morning. Peace to his ashes. Now he rests in the cool lap of the earth, free from all pain and suffering. Now he rests in the cool lap of the earth until one day we see each other again with delight before the throne of God. Sleep well, sleep well. Dear daughter, you said you’d like to have something of your father’s that he often carried/wore. I thought I would send you his kabe? He carried/wore this every day. Oh, how it hurts me to write this. Oh, dear daughter, I could write it with my tears, but I must console myself. Your sisters are all so good to me. That consoles me. I think your sisters will write to you. How is your dear Schali. Is his foot getting better? I hope you are all well. I want to end my letter with warmest regards to all of you from your loving mother, mother-in-law, and grandmother. God’s blessing in closing. Your loving mother. Mrs. Hannigan also sends her regards. She is still with me. Read the enclosed. Amen. Write soon. Photographs of present-day Undenheim and Biebelnheim.